Upon reading the first chapter, I knew I was going to love A Man Called Ove. Ove is quirky, snarky, and he totally stole my heart. I haven’t read any of Fredrik’s other novels, but I plan to pick them up after reading A Man Called Ove. Without even realizing it, I fell in love with Ove’s character and the kind heart he was constantly trying to hide. The writing is brilliant and hilarious, the characters are full of life, and the setting is perfectly created. Everything was written so realistically that I felt like I was trotting right along behind Ove throughout all of his ups and downs. There were portions of the novel where I was holding back tears and then two lines later, Ove and his neighbors would have me rolling on the floor laughing. 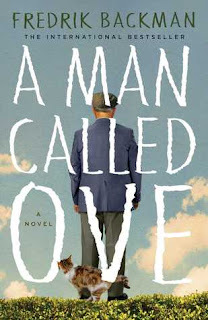 From start to finish, A Man Called Ove pulls the reader’s heart in and doesn’t let go. Frederik snags the reader from the beginning with Ove’s snarky attitude and continues reeling them in with heartfelt life lessons. You will finish this novel and immediately want to go befriend your neighbors and hug those that you love. I would highly recommend this book to readers of all genres.